Is a clever cordless design and user-friendly function enough to save VonHaus’ “nut busting” impact wrench from its battery issues? Cordless impact wrenches can save users a lot of time, effort and back ache, especially when dealing with over-tightened nuts and rusting bolts. However, this is only true when the wrench has the power and tools for the job. 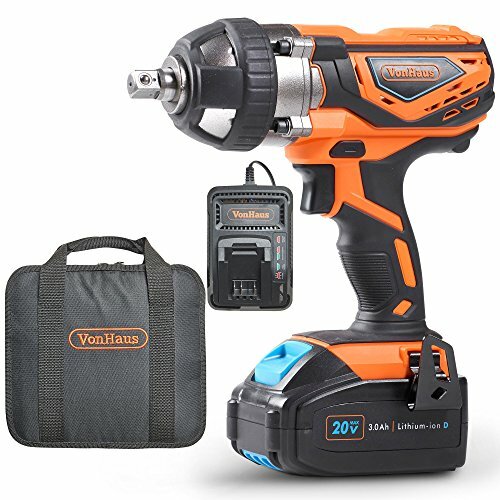 The VonHaus cordless impact wrench quickly lures consumers in with its affordable price, nice design and bold sales claims. This automatically seems like a powerful, accessible model that anyone can use. The different settings and features all suggest something functional, but with a small learning curve. The additional features for portability add to the appeal. VonHaus makes some bold claims about the power and performance of this cordless tool. Therefore, the main question we have is simple: is this device able to live up to those tough first impressions? A 2700 BPM and high torque action. First and foremost, this is a power tool WITH its own battery. It is important to state that right away because many of us will have made that mistake in the past. 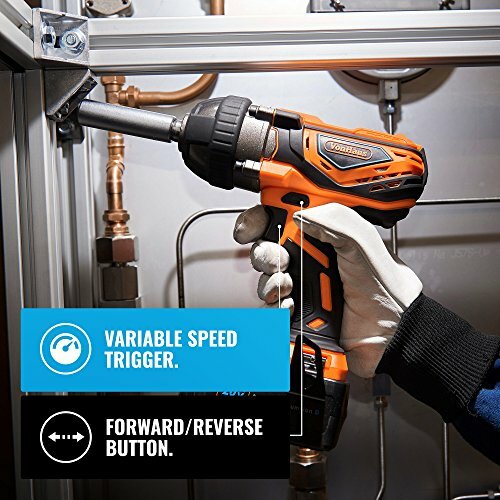 A cordless tool is not a power tool without a power supply – VonHaus understands that. Here the 3.0Ah Lithium-ion Battery powers variable speed settings for a high torque action and impact rate of 2700 BPM. In fact, the company promise that it is “nut busting”, with minimal effort on over-tightened and rusted nuts and bolts. Other features of note in the specification for this device include the use of aluminum in the head gear, the directional control and the belt hook. The wrench and charger then fit into their own storage bag. Finally, we should quickly mention the cost. As far as powerful, cordless models go. This one is pretty good value. This combination of clever details allows for a series of potential benefits for users. What advantages are on offer to new users with the VonHaus? We have to start with that power and the literal impact that the tool has on different projects around the home. User reviews are quick to highlight the effortless way that this tool handles the job at hand. 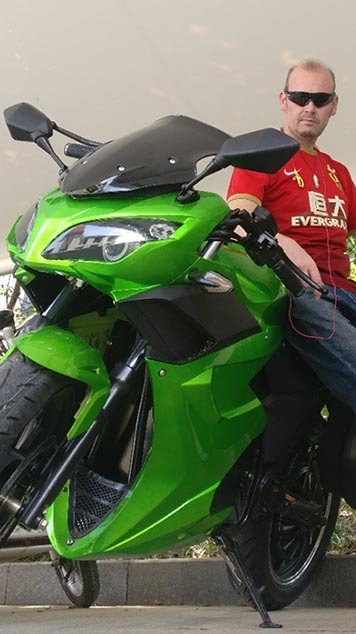 The strength of the torque, head gear and the speed settings all help here. The battery operation and design also means that while this looks like a complicated, high-end tool from Mission: Impossible that you are wielding out in the yard, this is mostly smoke and mirrors. The device is powerful. Yet, it does all the hard work and is very easy to use. The directional control helps when even the most experienced users slip up. The added benefit here is the appeal to users with limited strength and mobility. One great example is a report from a user that turned to this device to change his tires after back surgery. Many more feel that it saves a lot of time and effort compared to other models. Another important benefit here is the portability of the device. We should expect some degree of portability and ease of use from any cordless design. Here the developers have created something that we can use anywhere – provided we remembered to charge it up. The reliable battery and the ergonomic shape of the device allow for long-term use on bigger projects. Yet, the designers go further here with those other neat features for transporting this power wrench around. The belt hook is a simple little addition that they could have easily omitted entirely. But, this means that if you don’t already have a way to carry your tools on your hip, the device fits on a belt with ease whenever users need to keep their hands free. This is another time where that lightweight aluminum build proves to be useful. The lighter the weight, the easier it is to carry this way. These benefits of ease of use, power and portability are important. But, there are some disadvantages to this wrench as well. The first issue to talk about here is only minor, and that is the design of the case. There is just enough room here for the device, with the battery connected, and the charging unit. One buyer has suggested that they would prefer to disconnect the battery before using the device, which is not possible here. There is also no room for any additional batteries or items. Other users may prefer the case to be a little more sturdy and solid. The device may be tough, but an impact resistant carry case would offer greater peace of mind. The second issue regards the battery life. There are some strong opinions on both sides of the fence when it comes to the charging situation. Buyers tend to agree that the speed offered by the charging dock is a bonus here. The company promise just a 75 minute charge time and buyers don’t seem inclined to challenge that. The addition of the LED indicators helps. The problem is that some people find they will charge the wrench for 75 minutes, but then only get around 20 minutes of power. This short life is no good for those working on remote sites and away from outlets. It also works against that idea of a tough, powerful machine that is in it for the long haul–like those beasts from Caterpillar. 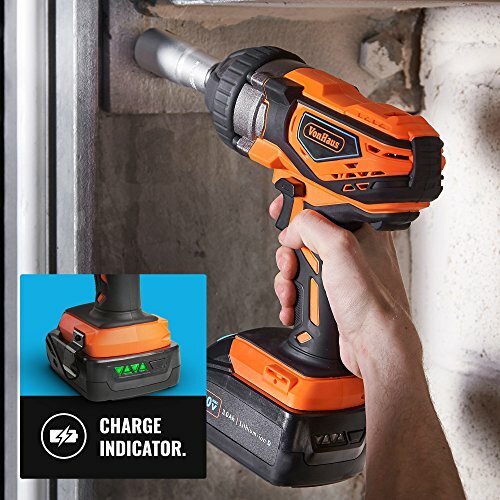 Let’s sum up all those pros and cons for a final verdict on the VonHaus battery impact wrench. Is this an incredibly powerful, “nut busting” device with great potential? There is no doubt that it can meet the requirements of many users. Furthermore, it could prove popular with those dealing with reduced strength and mobility. The combination of the torque and settings add to the reliability in different situations. Others appreciate the portable design, with the cordless approach, belt hook and case. Yet, there is still some work to do to make that case perfect, and to increase the battery life. 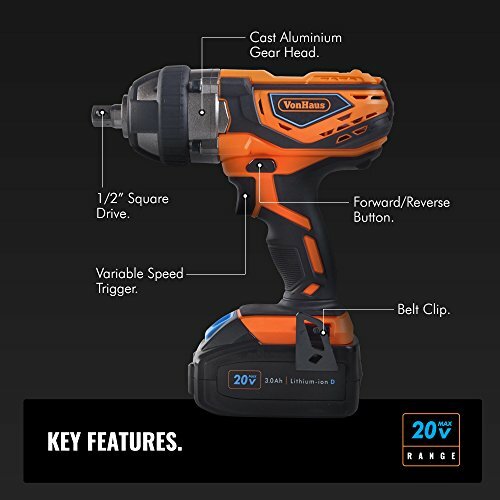 As things stand, this cordless impact wrench is recommendable to those that don’t want something for long-term jobs, and for those interested in more longevity, there are definitely other options available! Ultimately, it is still affordable, reliable and effective where it counts.